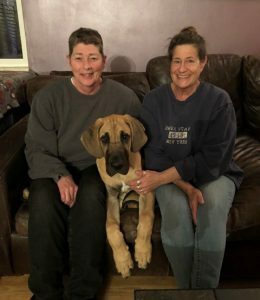 Asa has a home - Rocky Mountain Great Dane Rescue, Inc.
Asa has a home with his new family in Salt Lake City, UT! Asa will be Kara & LIz’s 3rd adoption with us! Beau, whom they adopted last year, crossed over the Rainbow Bridge in November and left Kara and Liz with a giant hole in their hearts. When they saw that Asa needed a foster home, they didn’t hesitate. It was love at first sight! Asa shares his home with Thor, a 12 year old Rottweiler/Shepherd mix, Abilene, an 11-1/2 year old Pit Bull, two cats – Ryder and Pinky, two ducks – Francie and Billy, and a turtle named Ms. Reggie. Asa will not be short on companionship, or love in this family! Way to go sweet boy!